We ship our books across North America. Now available digitally from this site. Save on the book cover price and save all shipping and handling charges. 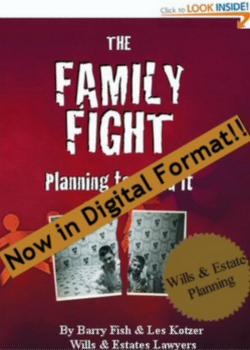 LIMITED TIME OFFER: Order The Wills Lawyers in digital format and receive a free digital copy of The Family Fight... Planning to avoid it. 1/ Canadian Customers Click HERE to order and download the Canadian digital version for $14.99 (plus tax where applicable). All orders must be delivered to a Canadian address. $18.95 plus shipping and handling (plus tax where applicable). If you Live outside of Canada, CLICK HERE to order and download the digital version (No Tax) for $14.99. All orders must be delivered to a Canadian address. $24.95 plus shipping and handling (plus tax where applicable). All orders must be delivered to a US address. $24.95 plus shipping and handling. Click HERE to order and download the Canadian digital version for $9.99 (plus tax where applicable). All orders must be delivered to a Canadian address. $14.99 plus shipping and handling (plus tax where applicable). Click HERE to order and download the US digital version of the book for $9.99. All orders must be delivered to a US address. $14.99 plus shipping and handling. All orders must be delivered to a Canadian address. $28.95 plus shipping and handling (plus tax where applicable). All orders must be delivered to a US address. $28.95 plus shipping and handling. 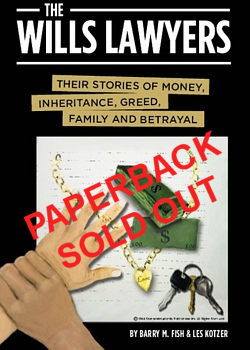 "If you love or hate your family- Read this book"
"This book is a real page- turner! It will change the way you look at life. Fish & Kotzer have hit another home run." KGO Newstalk 610 San Francisco"
"There is one book that is just the thing to bring sanity to this picture, and it made me a believer in preparation and prevention as the cure. It is called the Family Fight and is appropriately subtitled 'planning to avoid it'." 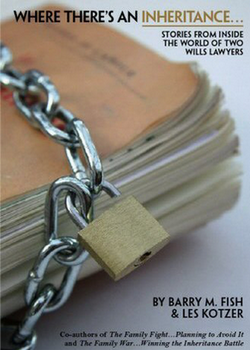 "Wills lawyer Les Kotzer is the guru of wills." 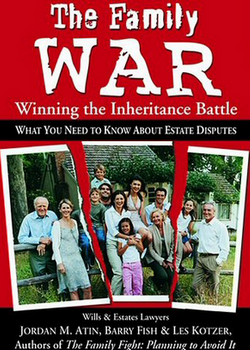 - "Dale Goldhawk - Goldhawk Fights Back "
Some of the links on this page are in PDF format. Please click on the Adobe icon to download and install your Adobe PDF reader.